What Causes Cheesecakes to Sink in the Middle After Baking & Cooling? Can I Rebake a Souffle? All souffles will fall, so serve them hot out of the oven. 3 What Causes Cheesecakes to Sink in the Middle After Baking & Cooling? 4 Can I Rebake a Souffle? The key to a savory spinach souffle that doesn't fall flat is serving it immediately straight out of the oven. All souffles will deflate as they cool down. Air incorporated into the egg whites of the souffle expands while it is cooked in the oven and forces the souffle to rise. When the souffle is removed from the heat, the air begins to cool and the structure begins to collapse and deflate or "fall." Although you can’t defy physics, by practicing a few steps, you will ensure that your spinach souffle rises and stays there long enough to be appreciated before it is eaten. Remove all the racks from the oven except the bottom rack. Brush melted butter to cover the inside of the souffle dish and the rim. Put 2 tbsp. of bread crumbs into the souffle dish and rotate the dish to fully cover the interior. Turn the dish upside down to remove any excess breadcrumbs. The butter and breadcrumbs will allow the souffle mixture to rise up the sides of the dish without getting stuck and staying flat. Preheat your oven to the temperature called for in your recipe. You may have to experiment a few times before you get your oven temperature just right. Note that if your oven temperature is too hot, your souffle will form a tough crust; if your oven is too cold, your souffle will not rise properly. Follow your spinach souffle recipe using precise measurements to ensure the best results. Beat the egg whites. Use room-temperature egg whites from week-old eggs and a metal bowl. Week-old eggs have less water in them than fresh and will work better. Beat the egg whites until they are slightly frothy, about one minute. Add a pinch of cream of tartar. Continue beating the egg whites until they are glossy and form soft white peaks that will stand on their own in the bowl. Do not overbeat until the eggs are dull; they won’t incorporate properly when you add them to your souffle mixture. Work quickly to incorporate the egg whites with the rest of your recipe because the whites will begin to deflate as soon as you have stopped beating them. Fold them in gently with a rubber spatula so that the mixture maintains its fluffiness. Fill your souffle dish to 3/4-inch from the top. 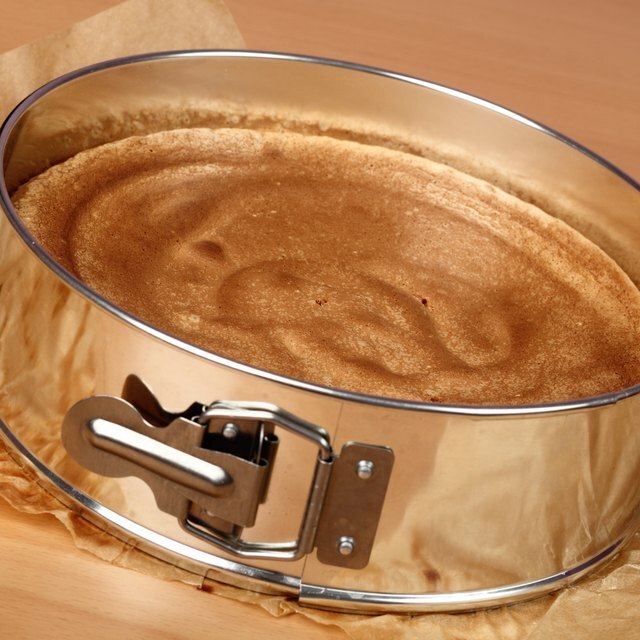 Place your souffle dish on a baking tray on the bottom rack of the oven. Prepare all serving utensils, plates and sauces so they are ready as soon as your souffle is removed from the oven. Have your guests already seated at the table before you remove your souffle from the oven. Serve your spinach souffle immediately. 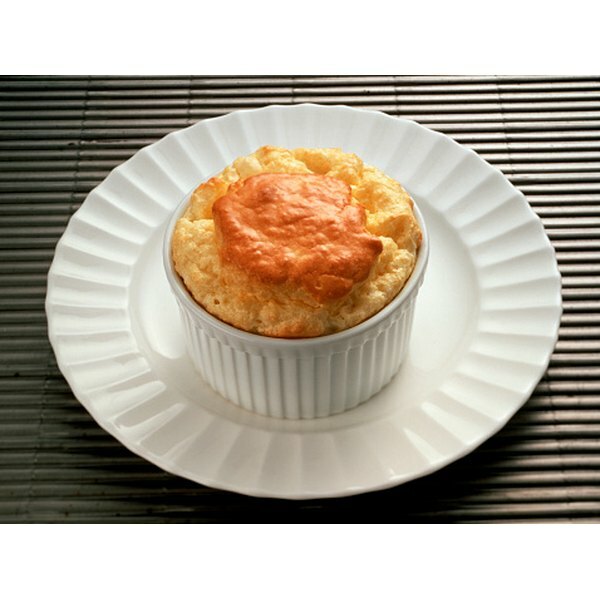 As soon as it is removed from the oven, your souffle will start to deflate as the steam inside it cools. Expect a small degree of falling; however, serving it right away will ensure that your guests will enjoy a sky-high spinach souffle. Ask the Chef: Question of the Day: Why Does My Souffle Keep Falling?